4 to 20 mA current loop output water level transmitters with a for use with process instrumentation for measuring the level of water in a water well, water reservoir, river or water storage tank. Choose a water level transmitter to transmit a 4-20 milliamp current signal using two wires for both power supply and signal. 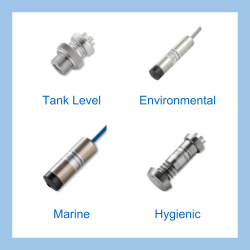 LMK307 Submersible Waste Water Level Sensor- Submersible waste water level sensor with optional intrinsic safety certification for monitoring the level of sewage and effluent in water treatment plants. LMP307 Submersible Level Transmitter- Submersible level transmitter for measuring liquid level with a 4-20mA current loop or a 0-10V voltage output plus optional ATEX approval for intrinsically safe use in hazardous areas in ranges from 1mH2O up to 250mH2O. The LMP307 is suitable for use on potable water with no leaching, and can be supplied with a drinking water certificate according to DVGW and KTW. IWSL Potable Water Submersible Level Sensor- IP68 protect pressure sensor for monitoring potable water level to depths of 100 metres. IMSTL IP68 Water Temperature and Depth Transmitter- Stainless steel 316L waterproof probe for measuring both water temperature and depth and generating two separate 4-20mA current loop measurement signals. 18.605 G Low Cost Submersible Diesel Fuel and Water Tank Level Sensor- Low cost OEM diesel fuel or water level sensor for installing inside or outside a storage tank. LMP 308 Removable Waterproof Cable Connection Water Level Sensor- Groundwater, tank & reservoir water level detachable submersible cable hydrostatic liquid level sensor for multiple municipal water level measurement locations. LMK306 Ground Water Level Transmitter- IP68 sealed hydrostatic level transmitter with a 17mm diameter for lowering into ground water boreholes for environmental monitoring of water level. LMK382 Low Range IP68 Waste Water Level Transmitter- Submersible Low Range waste water level transmitter with intrinsically safe option for monitoring the level of sewage and effluent in water treatment plants. Send us your enquiry for Water Level Transmitters with 4-20mA Output to get assistance with this product type.